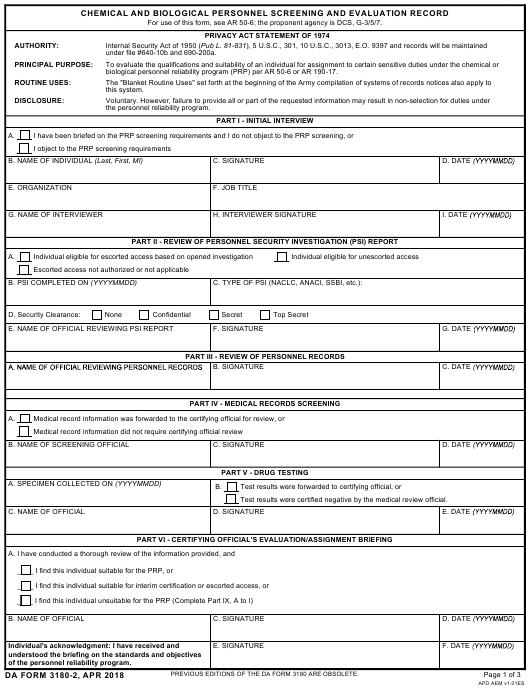 DA Form 3180-2 or the "Chemical And Biological Personnel Screening And Evaluation Record" is a Department of the Army-issued form used by and within the United States Military. The form - often incorrectly referred to as the DD form 3180-2 - was last revised on April 1, 2018. Download an up-to-date fillable DA Form 3180-2 down below in PDF-format or look it up on the Army Publishing Directorate website. biological personnel reliability program (PRP) per AR 50-6 or AR 190-17. Test results were certified negative by the medical review official. of the personnel reliability program. Document changes in individual's status and/or administrative data per local procedures. Use continuation sheets as needed. CPRP: The individual is no longer required to perform PRP duties and has been administratively terminated from the chemical PRP. BPRP: The individual is no longer required to perform PRP duties and has been administratively terminated from the biological PRP. Document changes in individual's status and/or administrative data. Use continuation sheets as needed.